Tributes will be paid today to the millions of British servicemen and women who have died in conflict since the beginning of the First World War 100 years ago. Armistice Day has been marked on the November 11 every year since 1919 - a year after the Allied forces signed an agreement with the Germans that would end WW1. Since last year's Armistice Day, seven members of the British armed forces have died in service - including five who died in a helicopter crash in Afghanistan in April. Richard Hughes, of the Western Front Association - which organises the Annual Service of Remembrance at the Cenotaph - said this year's commemorations were not just about marking the end of the First World War. "We have got the modern version here with us stepping back from Afghanistan. That itself has tremendous resonance," he said. This year's Poppy Appeal has been more successful than ever. The British Legion is on target to sell more than 45 million poppies by the end of Armistice Day - one million more than last year. This year it feels like there are more poppies out in the streets and a lot of different styles of poppy, because remembrance is very personal. In the year of the centenary of the start of the First World War, it is going to be very poignant at 11 o'clock when we stop to reflect on the losses for the British armed forces. As well as a number of local events across the county, the British Legion will be hosting a Silence in the Square event in Trafalgar Square today. The Western Front Association will host their Annual Service of Remembrance at the Cenotaph on Whitehall. 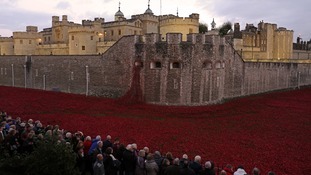 Armistice Day will be marked at the National Memorial Arboretum in Staffordshire and the final ceramic poppy will be planted in the art installation Blood Swept Lands and Seas of Red at the Tower of London. A look at the Tower of London's poppy installation 'Blood Swept Lands and Seas of Red' from the first poppy to the field of red.